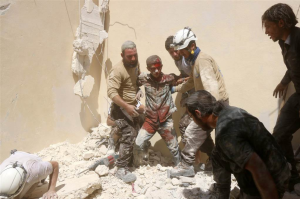 There is a relentless campaign by Assad supporters to discredit the first responders in Syria known as White Helmets who pull survivors & bodies out of the rubble after Syrian & Russian bombing. The accusation is that they are not volunteers as they claim but a political construct of the US & NATO who are embedded with “jihadist” & terrorist militias as a support network. They are also accused of participating in acts of terrorism. The accusation is made because White Helmets only do rescue work in areas “under terrorist control,” which is another way of saying in the cities where Syria & Russia are bombing. How that is considered evidence of criminality rather than just civilian rescue operations remains an enigma smelling of conspiracy theory. The chief evidence against White Helmets is their funding sources which are primarily from USAID, the UK, Holland & German governments. Those funding sources would give pause if you didn’t know how these international aid programs operate. We know something about them from international aid to Haiti after the 2010 earthquake, to Gaza after the 2014 Israeli bombing siege, & to Afghanistan throughout the 15 years of the war. Many governments pledge millions in aid & deliver zip. There is usually massive corruption & theft involved for aid that is delivered. In Haiti, the International Red Cross, Clinton Foundation, & other NGOs plucked those donations to the bone in grand larceny schemes. Nations pledged $5.4 billion to rebuild Gaza but then put Israel in control of the process so that nothing was rebuilt in Gaza. International aid programs are a scam that enrich a lot of NGOs but not the victims of war & disaster. What is called humanitarian aid is often a form of military aid. The case of international aid to Afghanistan is apropos to Syria because it involves USAID. In 2012, 70 nations pledged US$16 billion over 4 years, contingent on the Afghan government reducing corruption & increasing accountability for expenditures. Actually, the US muscles other nations for pledges so they will shoulder the financial burden of US-NATO wars. Then Secretary of State Clinton refused to divulge how much aid the US had pledged but claimed it was the largest amount. USAID is the agency most involved in dispensing aid & not just in Afghanistan. They claim the aid goes for development & humanitarian projects like schools, health facilities & reducing child mortality but cannot provide evidence of that because most of it is likely used to maintain the prisons & torture centers run by the CIA & US military, to facilitate CIA drug trafficking, & to bribe Afghan officials. There are credible reports that CIA agents associated with USAID wheeled in suitcases packed with money to bribe Afghan politicians. That’s why there’s so much corruption & no accountability & no way of knowing how much of that $16 billion in pledges was actually delivered or what it was used for. In September 2015, USAID announced $419 million in humanitarian aid to Syria, claiming the total of US aid was now over $4.5 billion & that the US was the largest donor to Syria. According to the announcement, the aid went to four different UN agencies: UNICEF, UNHCR (for refugees), IOM (for refugees), & OCHA (for coordinating humanitarian aid). Other unidentified NGOs were also to receive aid money to be used for medical care, vaccination campaigns, clean drinking water, food, shelter, & provisions like blankets & winter coats. There is no system for accountability, including from the UN, so who knows what that money was used for? In May 2016, after an investigation, USAID accused several NGOs operating In Turkey of systematic corruption involving a network of NGO staff & commercial vendors engaged in bid-rigging, bribery & kickback schemes on contracts to deliver humanitarian aid to Syria. One of the NGOs implicated was the International Rescue Committee (IRC), headed by former UK foreign secretary David Miliband. It is Henry Kissinger’s “charity”. Its board of directors include Timothy Geithner, Madeleine K. Albright, Kofi Annan, Henry Kissinger, Colin Powell, Condoleezza Rice, James D. Wolfensohn. Another major NGO implicated was the International Medical Corps (IMC), “one of the largest suppliers of medical aid to Syria,” which has connections to the Clinton & Gates Foundations. Millions of dollars were involved but neither the IRC nor the IMC was suspended from receiving USAID funding. Both organizations made a display of firing people. Corruption is standard operating procedure for USAID. The investigation only took place because an organization subcontracted to administer USAID’s work reported the problem. The White Helmets receive a reported $100 million–$23 million from USAID, $65 million from the UK, & the rest from Holland & Germany. How much of that is actually dispersed, to which agencies, & in what form? Equipment like ambulances? Medical supplies? To set up field hospitals? Is any of it channeled through the NGOs like the IMC? What do these governments get out of bankrolling first responders other than good press & justification for billions in humanitarian aid used for something else? But the real question in this campaign of vilification is why would disreputable people with connections to USAID (linked to the CIA) risk their lives by living in areas bombarded by Syrian & Russian war planes so they can rescue survivors & bodies out of mountains of shifting cement & metal rubble? What exactly is the nature of the crime they are being accused of? Risking their lives to save people? Photo is White Helmet workers rescuing a wounded boy from a collapsed building following airstrikes on July 17, 2016 in Aleppo. Now I have Canadian generals asking to be my friend. Before, it was only US Pentagon guys. Are those trolls going through every military in the world till I friend one? Just a word of advice: they can skip NATO, India, Pakistan, Syria, Russia, Iran, Egypt, & Israel. With Sanders enthusiastic campaigning for Clinton, Chomsky’s entirely predictable support for Clinton as lesser evil (he never could get that straight), & Angela Davis doing the “We have to defeat Trump by any means necessary” thing, lots of people are waiting for voters who refuse to vote lesser evil to fold. They’re waiting for panic to set in, for contrition from hard-assed types who say no to both (the majority of US voters), & they’re beating the drums furiously for Clinton. There are even unsavory types guilt-baiting Jill Stein supporters as white supremacists because they’re not whipped into a frenzy against Trump’s racism. Jill Stein has some serious political failings, particularly on Israel & US militarism, but she is crystal clear on lesser evil voting & undaunted by the lowlife baiting of her as a white supremacist. Voting lesser evil is an understandable choice if you don’t know how the US government is really run. The president is not a free agent. He/she is not just a ventriloquist dummy but they don’t formulate US policy; they administer policy formulated in think tanks, special agencies, special consultants like Kissinger, the Pentagon & CIA, corporation officials & Wall Street bankers. If you’re campaigning for Clinton & ignoring her political past (chock full of racist policies) or because she is more likely, in your fevered delusional imagination, to go to war against Assad, don’t pretend you’re doing the righteous thing because the only person you’re fooling is yourself. 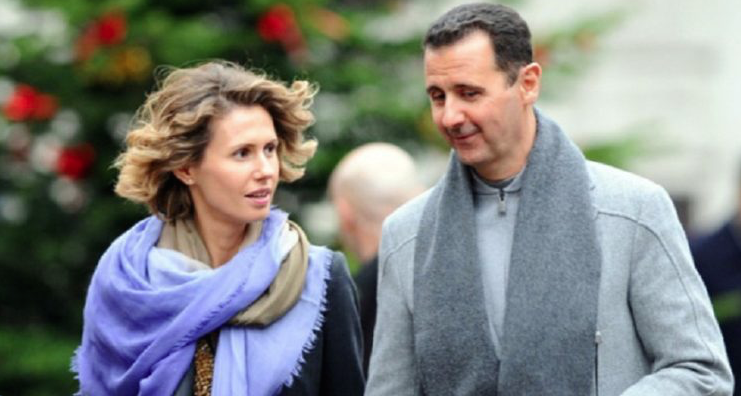 When pretty people carpet bomb a city of 275,000 people for two weeks, it’s done for humanitarian purposes. There are “jihadists” & Islamist terrorists there that have to be exterminated, even if it means leveling Aleppo. If civilians are buried in rubble it must be because they were collaborating with the terrorists. Calling Syrian & Russian bombing of Aleppo war crimes is just to demonize Assad & Putin when in five years of bombing, arresting, torturing, disappearing, killing, & driving out millions of Syrians, Assad has meant nothing but to show his love & commitment to the Syrian people. Pretty is the way you can distinguish between the war crimes of dictators & the humanitarian bombing of beloved & stylish leaders. Photo is Bashar & Asmas Al-Assad. No one so western could possibly be a monstrous dictator.